An excellent photo posted by Budgie which I had to blog! A plethora of types pose for the camera at the Kingsbridge HQ of Tally Ho! in April 1980. From the left, 1944AP is a Bedford Val / Duple which was new in 1963 to Bradley of East London. It came to Tally Ho! via South Milton garage in 1971. In the centre is another bedford VAL, this time with Marshall body, COD925C. This 1965 bus was new to Geddes of Brixham, and was a Tally Ho! acquisition from Brixham Coaches. 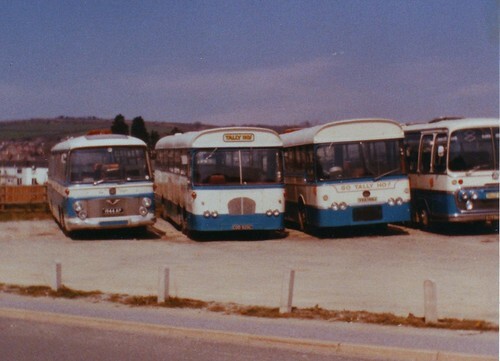 Finally, centre right is 1970 AEC Reliance / Plaxton YVA146J. Prior to Tally Ho! it was in service with Galpin of Plymouth. It was new to Hutchison of Overtown, Lanarkshire. I can just about remember Galpin of Plymouth and remember seeing a bus like this in Plymouth, but its a long time ago! Ironically its just been confirmed that Hutchison of Overtown is selling out to First Group later this summer.